The other evening I was at a friends house as our daughters played together. I accepted a last minute dinner invitation. My friend is from Piedmonte, from a small village called Briona in Valtelinna the Valesia region of the Colline Novaresi. This is the friend who helped me get started making my own pizza (something I continue to attempt, never terribly well). She made pasta for dinner, a type I'd never seen before, calamari-shaped. When I asked what it was called I believe she actually said "calamari." She tossed them in Sicilian pistachio pesto and topped them with a generous helping of aged Parigiano. This was a very delicious dish, by the way. While she was cooking she opened a bottle of red wine. 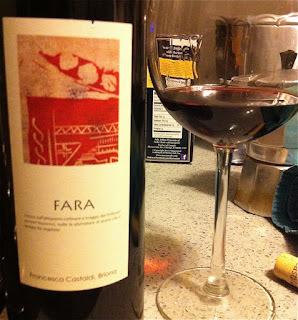 The label said Fara - I had never heard of this. My friend told me the story of the wine. Her mother's cousin inherited some money from a distant relative, enough to leave her job as an accountant and to pursue a new life as a wine maker. She bought some vineyard land in her village. This is her fourth or fifth vintage, and my friend said that the previous wines were not so great, but this one, the 2009 Cantina Castaldi Fara, is good. Anyway, we poured the wine and it was quite good - brightly fruited, snappy and refreshing with acidity, not terribly complex but aromatic and very lovely, and showing the structure that I suppose comes with the territory in Piedmonte. "What grape is she using here," I asked. "Hmmm, I don't know," my friend said. 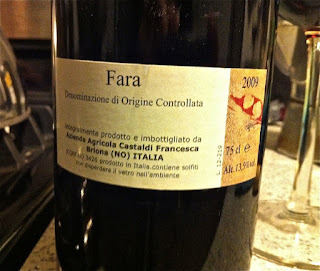 "She grows Nebbiolo, Barbera, and Uva Rara, maybe also Vespolina, but I don't know what is in here. Maybe it's Nebbiolo." We chatted about our kids, about their schools, about upcoming travel, about new apartments, and NYC in the winter time. I had my nose in the glass and was trying to figure out what the wine was, but I'm painfully ignorant when it comes to Italian wine. "I think it cannot be Nebbiolo - it's too approachable," I said. "Barbera, maybe with some Nebbiolo in there too?" My friend just smiled, and told me something about Sicilian pistachios, or maybe it was about how hard it is to get a good contractor for renovating an apartment. The point is, I realized, it didn't matter. Sure, I was curious, and I'd still like to know. 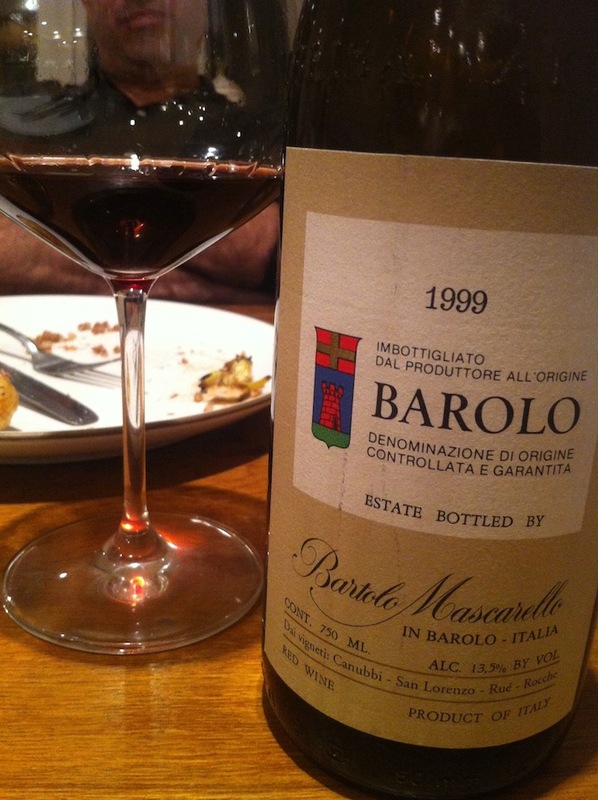 But my friend loves wine because she grew up with it (and Barolo was only for the most special of occasions, she says), and because she likes the taste with her meals. Is it Nebbiolo in this bottle, Barbera, Vespolina...it couldn't have mattered any less to her. What's important to her is the story of her grandfather's brother's daughter - her mother's cousin, and how she had this interesting life change. And my friend takes obvious pleasure in drinking this distant relative's wine. And she chose to share it with me, because she knows I love wine. There are many ways to enjoy this very fine and fascinating thing that we all love. It's good to experience these different types of enjoyment, especially the ones we don't typically engage in. 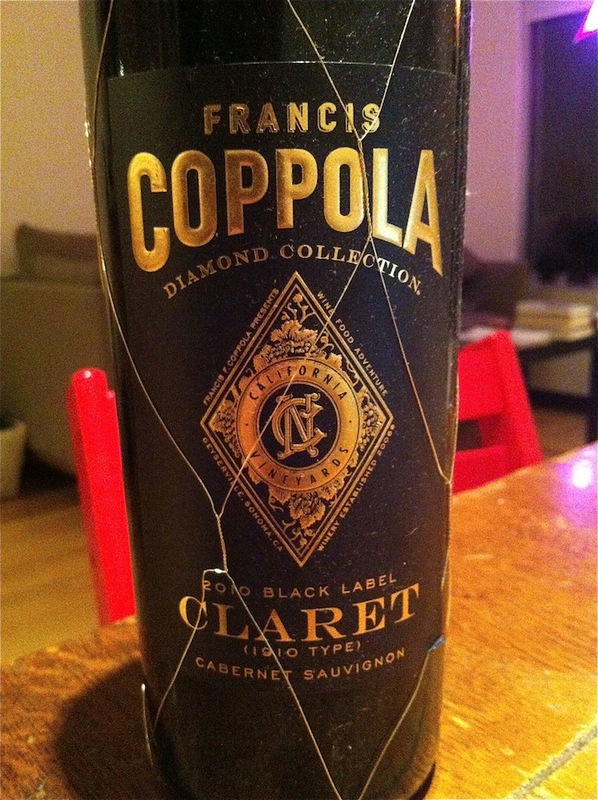 I cannot tell you the last time that I enjoyed a bottle of wine so much, having so little idea of what was inside. Drinking an Aged Fino Sherry. The other night I was lucky enough to drink a fino Sherry sourced from Bodegas Valdespino, one of the finest Sherry producers. There are two things that make this wine very special. Firstly, it was selected from special barrels within the Inocente solera by Jesús Barquín and Eduardo Ojeda, two-thirds of the team behind Equipo Navazos. And Ojeda is the capataz, or cellar master, at Valdespino (and La Guita), and so you have to figure that the two of them chose interesting and very fine barrels. Secondly, it was bottled in April of 2007. This wine had an average age of something like 10-12 years when it was bottled, but now it has aged in Peter Liem's cellar since release - it's almost 5 years in bottle. The common wisdom about fino Sherry is that you drink it when it's young, before it looses its freshness. There are some fino Sherries that probably should be consumed pretty quickly after release - those that are bottled unfiltered, and that still have small bits of flor floating about. The presence of flor makes it possible for the wine to continue to develop, to change in some way, and producers typically urge us to drink these wines within 6 months. I've heard Antonio Flores of Barbadillo Gonzales Byass say this about his palmas, for example. I do not have any personal experience cellaring a wine like this, so I cannot agree or disagree. 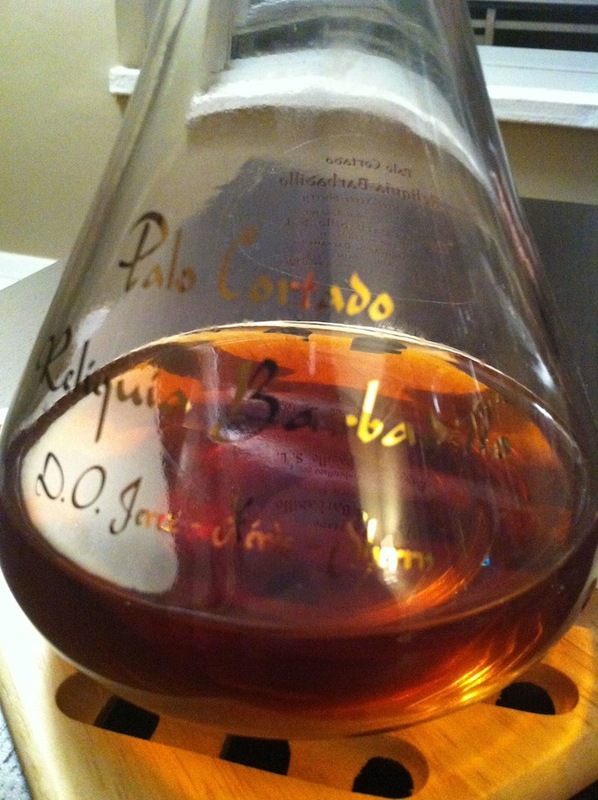 Regarding high quality fino Sherry, however, wines that have been lightly filtered - the common wisdom is wrong. You've read this here before, I know. The more personal experience I gain drinking fino with bottle age, the more I am convinced that this is a wine I am just starting to get to know. 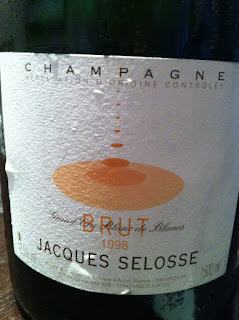 Like any other fine wine, it has an essential character, but it evolves in the cellar and shows differently as it ages. Equipo Navazos la Bota de Fino Nº 7 was a wonderful old bottle. It was Peter's very last one, and it was generous of him to share it over dinner at Aburiya Kinnosuke in midtown. And if you haven't yet had Sherry with Japanese izakaya-style food, you really should try it. The fino needed a little air but it opened up beautifully, and at this stage in its life showed rich and mouth-watering notes of butter and toffee, although I was able to sense the delicate sea-sat mineral undertone. Peter smiled when I told him this, and explained that La Bota Nº 2 (also a fino sourced from the Inocente Solera) and 7 are very different from the current release, Nº35. They were brawnier and bigger upon release - Jesus was interested in making a bigger wine back then, I guess. 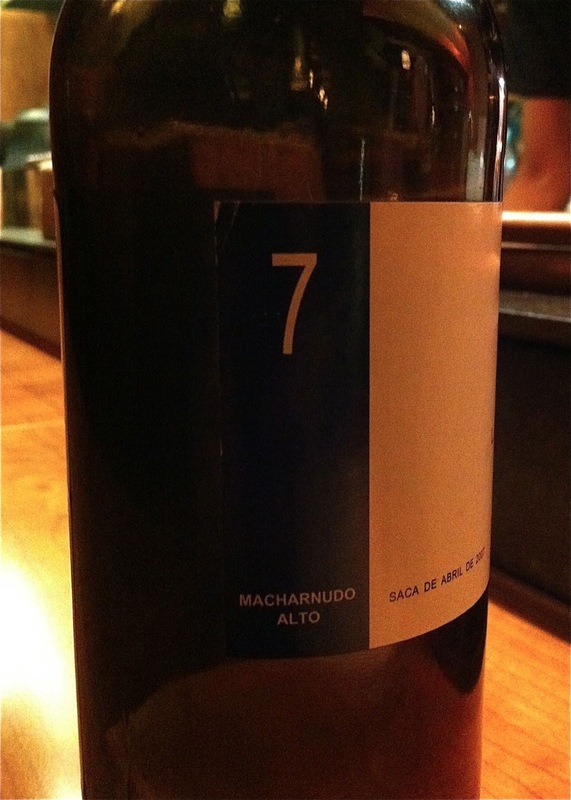 With time in the bottle, though, I experienced Nº 7 as a delicate wine. Rich, but delicate. 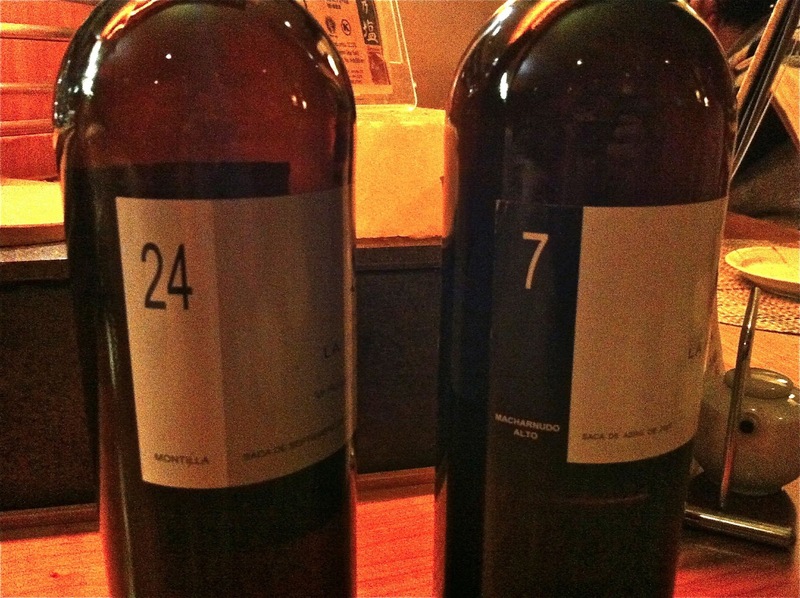 We drank this next to my last bottle of La Bota de Fino-Amontillado Nº 24, bottled in October of 2010. This is a fantastic wine, Peter calls it "probably the best PX ever made." I've been fortunate enough to drink a lot of this wine, and it has changed since it was first released. On this night it was bright, energetic, and focused, and entirely delicious. What shocked me was how young it seemed, next to Nº 7. There is a lot of life in these wines, plenty of potential for development in the cellar. It is my goal to be better about actually saving a few bottles. It's hard though because the wines are so delicious from the very start. Note to self: get some fino self control. 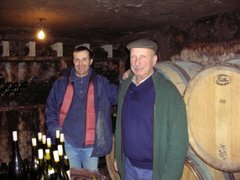 Burgundy Wine Club 2013 - Chevillon, Lignier, Montrachet, and Musigny! 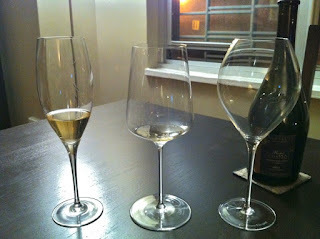 I got into wine too late to be able to drink things like La Tâche, Chambertin, or Musigny. There was a time not too far back when a person could buy a bottle of wine like that and yes, it would cost a lot, but buying a bottle wouldn't necessitate changing the way you live. Now, a bottle of mature Chambertin by a top producer costs at least $1,000. La Tâche...fugedaboudit. But these are among Burgundy's greatest vineyards and they give wines that all of us would love to taste. How, in this day and age, can those of us who do not manage hedge funds experience these wines? Burgundy Wine Club is the answer, my friends. Seven friends and I kick in a few hundred dollars every year, and by pooling our money we are able to buy expensive wines that none of us alone would purchase. Not only are we pooling our resources, we are also sharing the risk of flawed bottles. I am graced with the task (joy is more like it) of choosing the wines, and the theme of our annual dinner. Last year we drank a lot of Pommard, which is now a curse word in my house. The year before that we focused mostly on Volnay. This year I was not as concerned with picking one theme, and instead focused on finding bottles that I really wanted to drink - things I'd never had before that would be accessible to me only via Burgundy Wine Club. So, we drank a bottle of Montrachet (! ), several bottles by Robert Chevillon from the early '90's, some Lignier Clos de la Roche, and yes, we drank Musigny. 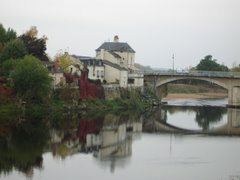 Musigny!!! Obviously there is visceral pleasure in drinking these wines, and in the act of getting together with good friends for this annual Big Night of Burgundy. I learn a tremendous amount too at these dinners, and this night especially so. I learned for myself why it is that Les Saint Georges is considered to be the finest terroir in the southern part of Nuits Saint Georges. I was reminded that Montrachet is great, but appreciated the way that some vintages give more of a thrill than others. I learned what Clos de la Roche tastes like, what it really tastes like. And I learned that Musigny, even from a poor vintage, is one of the true apexes of red wine. We gathered at the bustling and energetic Manhattan hot spot The Breslin, where my friend Carla is the wine director, and she and her team were amazing. We opened the bottles as we sat down, poured the Montrachet, and mostly let it sit in the glass to open up over the course of the next few hours. We began with wines by the great master of Nuits Saint Georges, Robert Chevillon. Chevillon makes wines from 8 vineyards of 1er Cru standing: 4 in the northern and 4 in the southern part of Nuits Saint Georges. His wines are known for their transparency and terroir expression. We drank only wines from the southern part of the village (the northern side continues up the hill to Vosne-Romanée), including the great vineyards of Les Saint Georges, Vaucrains, and Les Cailles. 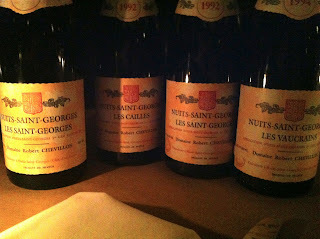 With onion soup laced with bone marrow we drank 1994 Les Vaucrains and 1994 Les Saint Georges. 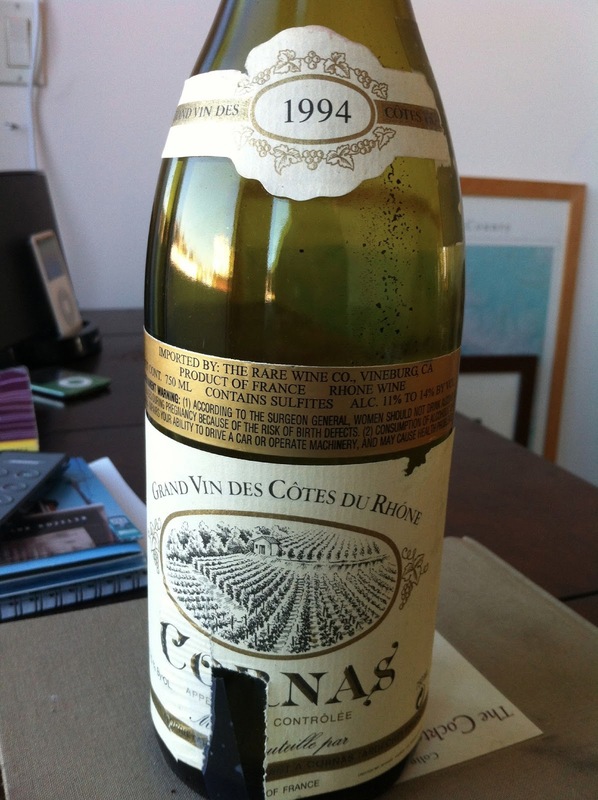 1994 is thought of as a poor vintage, but these wines were terrific. Vaucrains was bright and energetic, and also showed a bit of a rustic side. It was balanced and long, and the fruit was still lively. 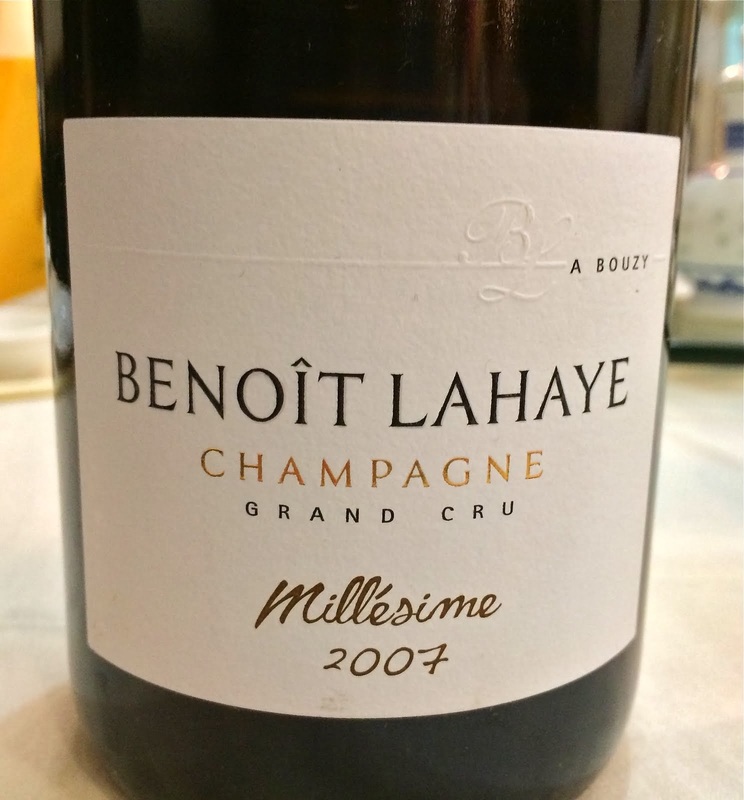 Les Saint Georges was, even on the nose, immediately recognizable as the finer terroir, with greater depth and complexity, it was a more complete wine. 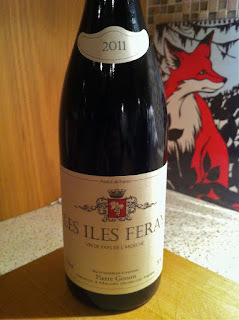 I was thrilled by the way the wine combined density and power of flavor with a silky and graceful frame. 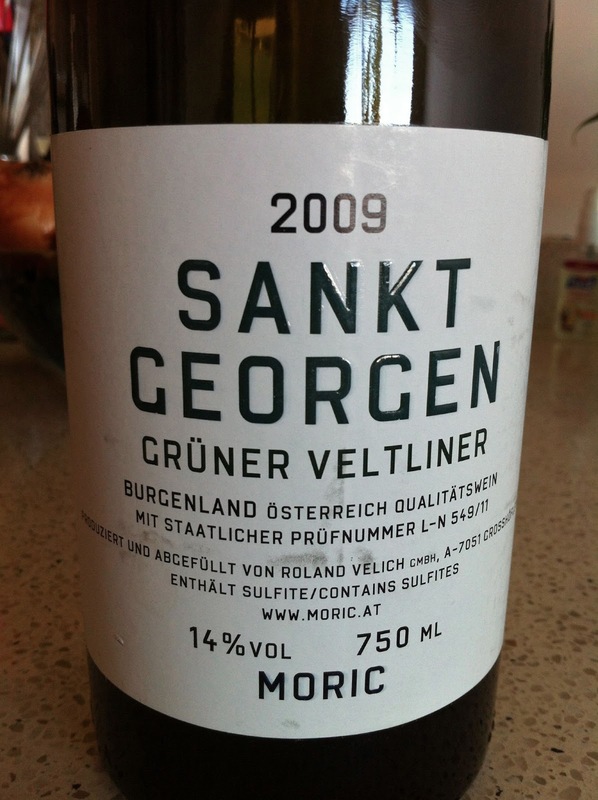 One experienced drinker found the alcohol to be a bit intrusive at 13.5%, but still thought it was a great wine. Oddly enough, Vaucrains was the better pairing with the onion soup, meshing perfectly with its salty and savory flavors. With various savory vegetable plates we then drank 1992 Les Cailles and 1992 Les Saint Georges, and sadly, this wine was corked. I actually did not identify it as such, and neither did most of us. Some found it a bit musty, I found it simply to be not terribly complicated. An experienced drinker suggested it was corked and it made sense. Live and learn. Les Cailles however, was the prettiest of the Chevillon wines, with rose inflected red fruit that glowed with energy. Chevillon! These are wines that can still be purchased without liquidating my retirement account, and they are wonderful wines. There are several great producers of Clos de La Roche, including Dujac, Rousseau, Ponsot, and Lignier. 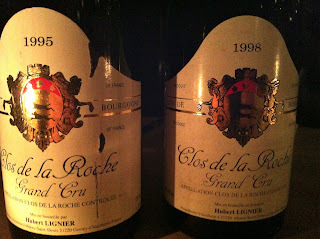 On this night we drank two bottles of Lignier Clos de la Roche, and both were great wines. I've read that Clos de la Roche gives one of the longest lived red wines in Burgundy, and that as per its name (roche = rock), the wines show pronounced minerality. The 1998 Clos de la Roche was superb, with intensely savory and smoky aromas and flavors that were completely shot through with stone. I loved this wine, and it's funny because it wasn't pretty or even very approachable, but it was detailed and intense, and I was assured by experienced drinkers at the table that this was quintessential Clos de la Roche. The 1995 was delicious, with more pronounced fruit and generally more approachable, but I found less complexity, less intensity of stone - less Clos de la Roche. I would love to drink the 1998 again in 10 years. 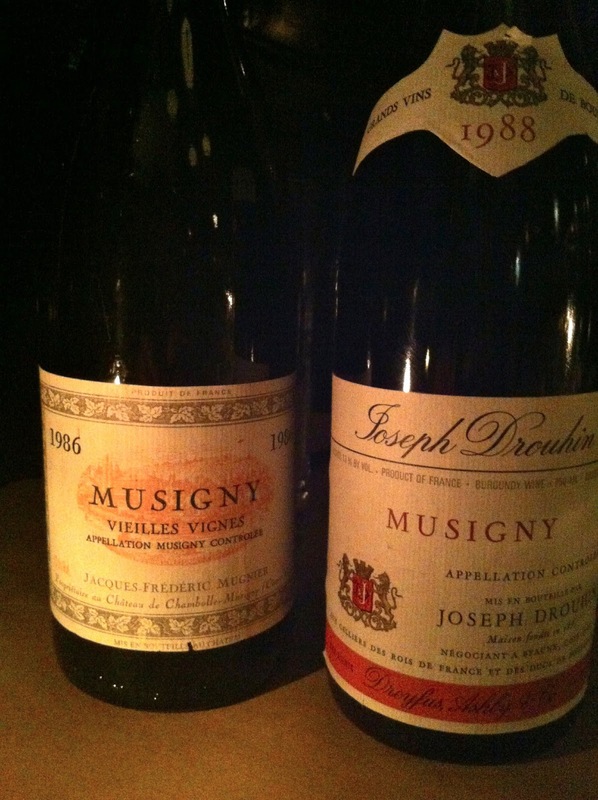 With a gorgeous set of homemade terrines and pâtés, we drank Musigny. First I should tell you that the 1988 Drouhin was drastically heat damaged and completely unsmellable, never mind undrinkable. This is a shame of epic proportions, but such is life. Thank goodness we were able to experience the 1986 JF Mugnier Musigny Vieilles Vignes, as wonderful of a red Burgundy wine as I've ever had. Another poor vintgage, and another great wine. If La Tâche is aromatic fireworks, if Clos de la Roche is rock, and if Chambertin is raw power, Musigny is complexity and grace, spherical like Montrachet. I'm not going to be able to describe the smells and flavors here, but I can tell you what it felt like to drink the wine. The nose undulated. I thought of a dimly lit room with a lush red velvet robe tossed haphazardly on a couch. So many aromas moving, and in all directions, always graceful. I must have smelled the wine for almost a half hour before taking a sip, and when I did I was shocked by the energy and power on the palate. The nose was glorious, but docile. The palate, anything but docile. This was a haunting wine, as thrilling to me as any red wine I can remember drinking. And I wasn't the only one - most of us at the table were fascinated with this wine and I saw people swaying as they smelled, as if praying at the Wailing Wall. 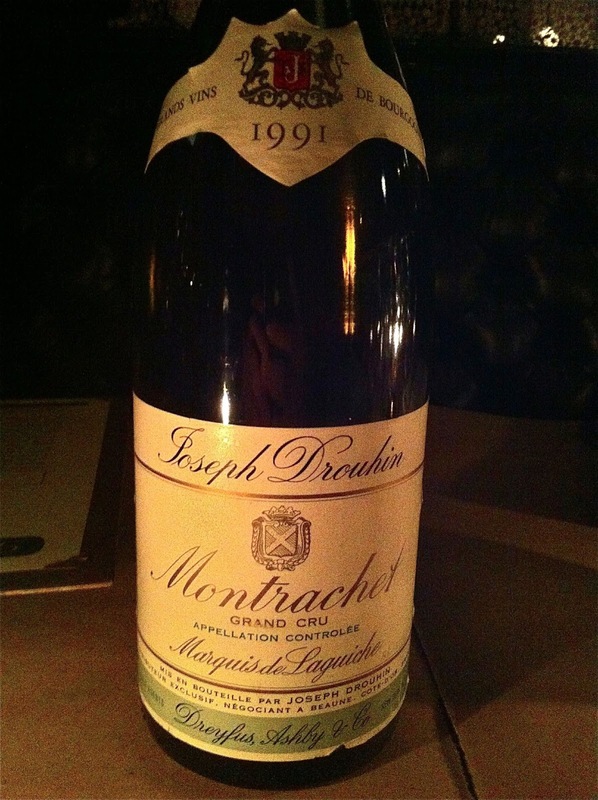 And to cap it all off, we drank Montrachet, the 1991 Marquis de Laguiche / Drouhin. Although this wine showed plenty of class and breed, I thought that it was not as great a wine as the only other two bottles of Montrachet I've had, same producer but 1989 and 1988 vintages. The 1991 was excellent but it showed a bit thick, with surprisingly sweet flavors, and without the focus I would have liked. An experienced drinker said that he detected some botrytis and this makes sense. Criticizing Montrachet is sort of like criticizing Mozart - who am I, really to say anything here. Just sharing my thoughts, that's all. On a recent Friday afternoon I had a little special time with my younger daughter, who had just turned 4 years old. Her older sister was still in school and the younger one and I were about to have lunch. She is more adventurous than her older sister as an eater, and has lately been showing an interest in the process of cooking. She likes to stand on a step stool and watch as I cook, and enjoys doing little jobs like mixing the wet and then the dry ingredients when we make pancakes, or putting butter in a hot pan and swirling it around with a spatula. On this day I thought why not let her choose what we eat for lunch, and maybe she can play a larger role in cooking. I set out some choices for her - we had eggs, leftover polenta, fresh marjoram and rosemary, dry sausage, broccoli, carrots, and a few other things that I cannot recall. 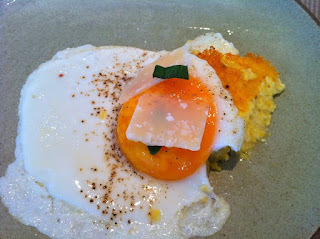 She chose polenta and we agreed that we would fry it to make the sides crispy. She decided that we would put an egg on top (perhaps she is familiar with the "egg-on-top" that currently pervades every menu in Brooklyn). She put butter in a hot pan, cracked an egg into a bowl, and helped me pour it into the pan. She smiled at the sizzling noise, because this time she made that noise happen, not me. She decided on sunny-side up for the eggs. I would have gone with whatever she decided, but this was a good choice. Scrambled eggs on polenta doesn't sound so appealing. She helped me take the eggs out of the pan and place them on a plate. She used a butter knife to cut polenta patties from the log I shaped out of the leftovers, and then helped me to carefully put two patties in the pan. She helped me turn the patties to brown the other side. We put the browned patties on plates and she helped to put the eggs on top. She decided to put two marjoram leaves on top of the eggs, some salt and pepper, and then she decided that we would have thin slices of Parmigiano cheese on top, not shaved cheese. She was very proud of her work, and she cleaned her plate, which is not unusual, but I detected an added relish as she ate. I was proud of her, as you can tell, and by the way, our lunch was delicious. This is going to be fun, cooking with my daughters. The Vulgar Little Monkey, or VLM as many like to call him, is back writing on the internet. I like his writing because it's completely honest, because he is clear about his particular point of view, and because he makes me laugh. I recently read through his blog posts since he picked it up again in October and it's satisfying stuff. Most of the posts list wines he's had, along with tasting notes. This sort of thing can be uninspiring at best, but the VLM makes it rewarding, in my opinion. 2009 Bernard Baudry Chinon Franc de Pied, $26. This is Baudry's ungrafted vines cuvée from the sandy base of the Clos Guillot vineyard. I've heard that ungrafted vines make wines that should be consumed young, and I've heard the opposite too. This wine showed very well, but showed young. Not all wound up and tight, but young - all fruit still. The dark fruit was lovely and the mineral complexity was there, although just barely articulating itself. This wine is clearly of very high quality and is very well balanced, especially in the context of the warm 2009 vintage. Enjoyable now but I think worth leaving in the cellar too. 2009 Domaine Ganevat Côtes de Jura Cuvée de L'Enfent Terrible, $34.This is Ganevat's Poulsard. Ganevat red wines are almost always reduced and terrifically funky when first opened, and need a good decant to show well. To my taste, this is the finest Poulsard after Houillon/Overnoy. This was a great showing. I decanted it 5 hours before drinking and it needed every moment. When we drank it, it was clear as a bell, completely pure and harmonious and not at all overripe, although the ripeness of the vintage shows. Great complexity and balance. But the thing that makes it special is the purity of the focused red fruit - the crystalline nature of the wine is like that of a white wine. Very lovely, but now the price is closer to $50. If you love Poulsard, probably this is one to buy. Cédric Bouchard Roses de Jeanne Champagne Inflorescence Blanc de Noirs (2008), $55. No surprise here - this wine is all 2008 fruit, a great vintage in Champagne, and Bouchard makes great wines. This was simply excellent - the purity of fruit rather startling. Saline and chalky, and the texture is all silk. It was still growing and improving when we finished it. Beautiful now, but certainly one to leave in the cellar too. 2007 Muhr-van der Niepoort Blaufränkisch Carnuntum, $18.I loved this wine a year ago and saved one bottle, hoping to leave it alone for a few years. I made it through one year, so I was partially successful. The wine was gorgeous on day one with broad and vibrant aromatics - flowers, various fruit, clean and very lovely. The palate wasn't as expressive, although there was an intriguing mineral floor and this was the main impression on the finish. On day two the wine lost some of its explosiveness on the nose, but was more complete on the palate, with clean, cooling, mineral-infused fruit. Worth the wait, and I should have bought more. 2007 Hirsch Riesling Gaisberg, $34. Hirsch is one of the better regarded producers in Austria's Kamptal region. Heiligenstein is considered to be the vineyard with the best potential, but I like the Gaisberg wines very much also. This wine showed beautifully. I decanted it at 4:00 and we drank it at 7:00, and it needed the time. Some found a bit of petrol on the nose, but I wasn't one of them. For me it is still about perfectly ripe yellow fruits and rock. There is lovely balance and harmony at 12% alcohol and it feels savory on the very long finish. Just excellent wine. 2007 Prager Riesling Smaragd Achleiten, $50. Also took many hours to open up, which I guess shouldn't be surprising. I love the 2007 vintage in Austria - it's my favorite of the recent vintages, but the wines are definitely in a closed phase. I decanted this for a few hours before pouring it back in the bottle and taking it to dinner, and it was still shut down for hours. That said, it opened eventually and the wine is excellent. Balanced, richly fruited, mineral, complex, and with a strong presence on the palate. A real beauty. 2006 Domaine de l'Anglore Côtes du Rhône Comeyre (magnum), $64. I loved this wine at a trade tasting maybe 5 years ago and I bought a magnum, thinking I would bring it to Thanksgiving dinner in a few years. It wasn't Thanksgiving, but I brought it to some dinner party, and wow, have my tastes changed. It is high quality wine, aromatic and tasty, but it smells more like !--Natural Wine--! than it does like old vines Carignan, and there is no sense of place whatsoever. Not a style of wine that interests or truly satisfies me. 2005 François Chidaine Montlouis-sur-Loire Les Choisilles, $28. I bought a few of these several years ago and first drank one only recently. This is one of Chidaine's dry wines and in the warm 2005 vintage it is 14% alcohol but seems lower because the wine is so well balanced, and the acidity keeps it bright and refreshing. Nose is just lovely, albeit a bit shy on day 1, and the aromas are perfectly delicate. Wool, beeswax, winter herbs like rosemary, yellow fruit, and all wispy and always moving. 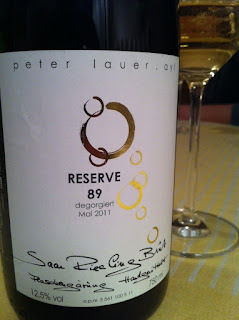 There is a lush feel to the palate but it is focused and essentially dry. Such lovely wine. 2005 Domaine de la Pépière Muscadet Clos des Briords, $13. I drank almost a case of this wine in 07 and 08, but saved a few bottles. Decided to check in on the wine, and time has clarified the aromas and flavors here. Especially on day two, there are lovely seashell aromas and citrus oils - grapefruit. The palate is balanced and has a bit of grain in the texture. A bit broad perhaps, not as focused I imagine as some other recent vintages will be as they age, but this is lovely wine. There is no "perfect" moment, so don't waste life by waiting. Share and enjoy today. But it's also important to be patient. Accept the kindnesses of strangers. Be gracious at all times. Consume only what is necessary, not to excess simply because something is available. Keep experimenting, never stop learning. Wonderful things of great value can come in modest packages. There is nothing more valuable than a true friend. Heres to a great 2013!